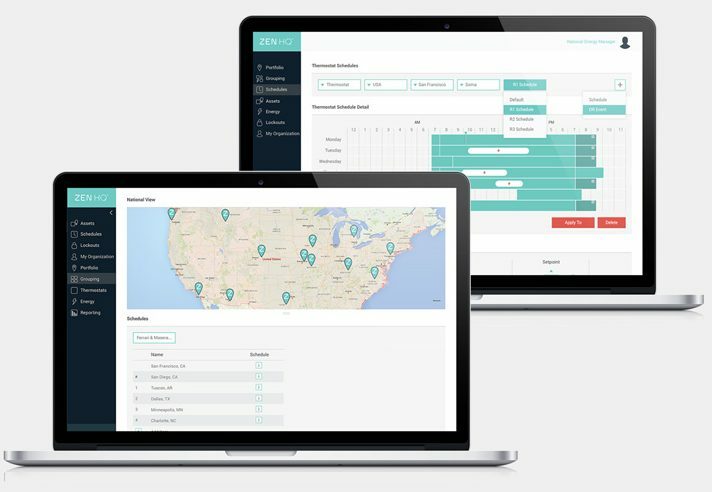 by Brianna Crandall — April 16, 2018 — Technology providers Zen Ecosystems and Eyedro Green Solutions have just announced a partnership to integrate Eyedro’s near real-time electricity monitoring equipment and software with Zen Ecosystems’ intelligent commercial energy management platform, ZenHQ. Zen HQ provides insights and control over multisite commercial energy usage while delivering a fast payback. With an intuitive interface, the Zen HQ platform allows for quick changes to HVAC settings, schedules, set points and access permissions right from your desktop or mobile device. Designed with ease-of-use in mind, Zen HQ allows facilities managers (FMs) to make energy-slashing changes to building control systems immediately, without the steep learning curve. This new integration with Eyedro will offer current and future Zen HQ customers access to more detailed energy-related data for optimizing electricity use, saving money on utility bills, streamlining business HVAC management, and reducing their carbon footprint. Eyedro’s easy-to-install hardware and MyEyedro cloud software package enable Zen HQ to collect and transmit data at the individual load level in five-minute intervals. Zen HQ will analyze the usage across building operations and deliver insights through comprehensive energy reports for building managers to enhance lighting, ventilation, cooling and other building operations. Eyedro is currently installed in more than 130 countries. Energy management is a complex arena, with countless opportunities for greater efficiency, but transparency is key. Eyedro’s integration allows customers who are already saving with Zen HQ to monitor more and use actionable insights to make changes that improve their energy use, and ultimately, their bottom line. Restaurant franchises have some of the slimmest margins in the business. Diving deeper into new data streams with the Zen HQ and Eyedro integration will help businesses of all sizes identify energy drains. As we offer increasingly precise energy use data, we identify new opportunities to achieve electricity savings and support businesses’ bottom lines. Eyedro solutions will be offered in tiered packages and price points to all Zen HQ customers over the next six months, and a simple user interface will be added prior to the full roll-out. The integration is estimated to provide 10-30% in savings for sustainably minded businesses. For more on the collaboration, visit the Zen Ecosystems or Eyedro Green Solutions Web sites. Guess which services data centers are seeking the most, and see how FMs can stay on top of recent trends April 25, 2018 In "Surveys and Trends"